The success of the Punk Goes series has been growing over the past couple of years. 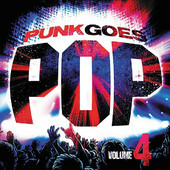 This year’s release Punk Goes Pop Volume 4 is one of my favorites that have come out. So, I have decided to give you a video post of every song I could find, and I recommend you listen to ALL of them! Enjoy!! My favorite has to be Go Radio’s rendition of Rolling In The Deep… Let us know what your favorite is! Atlas Genius Covers Daft Punk's "Get Lucky"
Icona Pop's New Single "All Night"